EAGAN, Minn. — The Minnesota Vikings had just secured their new quarterback with the splash move of the NFL’s offseason. Coach Mike Zimmer was busy working on addressing another area that needed an upgrade. The same day Kirk Cousins was introduced with his $84 million fully guaranteed contract, Zimmer was watching video of some of the top defensive tackle prospects in the upcoming draft. Then the solution literally walked into his office to greet him. 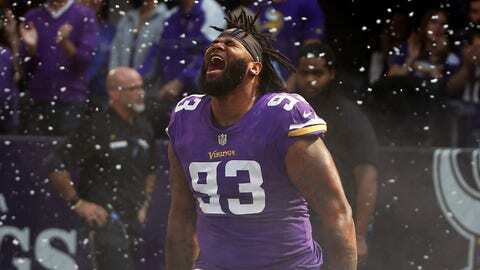 Sheldon Richardson was at team headquarters on a free agent visit, which the Vikings didn’t let him leave without signing him to a one-year, $8 million deal . As important as Cousins has been and will continue to be, the value of adding Richardson can’t be overlooked. His presence on the interior at the position next to the nose tackle commonly called the “three technique” has provided a critical boost to the defense in both stopping the run and rushing the quarterback. “Sheldon’s done a great job of coming in here and kind of fitting into our culture and the way we do things,” Zimmer said, crediting Richardson as well as defensive line coach Andre Patterson. According to SportRadar, Richardson is fourth among all NFL interior defensive linemen with 21 quarterback pressures, behind Aaron Donald (53), Fletcher Cox (26) and Geno Atkins (25). Richardson had two sacks last week against Green Bay, a bonus from a position where disruption in the backfield is the priority. The three technique is a less-heralded role on the team than the premier edge pass rusher or the ball-hawking safety. But it’s essential to Zimmer’s scheme to keep the linebackers free to roam from side to side, limit the rushing yardage up the middle, and reduce double teams on the defensive ends. The Vikings seek first-step and lateral quickness from their three technique, which gets its name from a long-ago-established numbering system for designating alignments by defensive linemen. Richardson, a first-round draft pick by the New York Jets in 2013 out of Missouri, was the AP Defensive Rookie of the Year before eventually falling out of favor and being traded to Seattle. After one season with the Seahawks, Richardson was widely considered the best available player at his position on the market last spring. His decision to sign with a contending team on a prove-it contract has set him up well for a much bigger payday. The Vikings play at New England on Sunday, with pressure on Tom Brady a must for slowing down the Patriots and their prolific attack. The defense has been especially successful lately at generating a rush from the front four without having to send an extra blitzer or two from the linebackers or defensive backs. The Patriots have plenty of experience defending him, of course, from the eight times they faced the Jets over his first four seasons.